NOTICE: Activation key must be used on a valid Steam account. 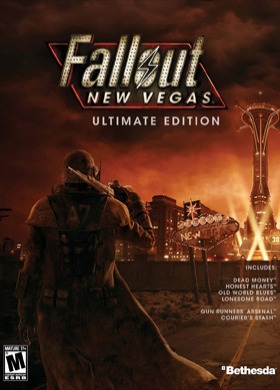 Requires internet connection.ABOUT THE GAMEWith the introduction of the Ultimate Edition, Bethesda Softworks offers you the chance to double-down andget the complete package of New Vegas fun. For the first time in one package, you can get all the Fallout: NewVegas content including the full suite of highly acclaimed add-on content: Dead… Money, Honest Hearts, OldWorld Blues and Lonesome Road. To sweeten the pot, you’ll be armed with the latest cache of unique weapons,ammo types and recipes from the most recent add-on packs: Courier’s Stash and Gun Runners Arsenal.Whether you’re a seasoned explorer of the Mojave or playing the game for the first time, you’ll find there aremore friends and enemies to make, more consequences to your actions and more opportunities to live in gloryor infamy throughout the Wasteland. The choices you make will be as crucial to your survival as ever.KEY FEATURESBeyond the Wasteland: The world of New Vegas is more expansive than ever. Eachnew distinct area presents a fresh set of branching-quests, remarkable personalities andmore chances to play the Savior or the Pariah to the natives of New Vegas. Dead Money: Lured into a trap masquerading as the Sierra Madre Casino, you arethrown into a high stakes game where you’ll have to work with three other lost souls ifyou want to survive.Honest Hearts: An expedition into Utah’s Zion National Park goes horribly wrong andyou become embroiled in a war between tribes and put into a conflict between a NewCanaanite missionary and the mysterious Burning Man.Old World Blues: Transported to the Big MT research crater, you are enlisted by theThink Tank to save them from their own science experiments that have gone horribly outof control.Lonesome Road: Ulysses, the original Courier Six, contacts you and promises toanswer why he refused to deliver the Platinum Chip at the start of Fallout: New Vegas, butonly if you make one last journey into the treacherous canyons of the Divide.Shiny New Toys: Each add-on packincreases the mountain of armamentsalready at your disposal. Whether you’re anin-your-face brawler or a long-range gunner,weapons such as the Two-Step Goodbye(unique ballistic fists) or Sleepytime (ahandy 10mm Sub-Machinegun) will givethat warmonger in you a chance to flexyour ammo-filled muscles.Room to Grow: With each of the fourmain add-on packs, the maximum levelcapis increased by 5 levels, ultimatelyraising the ceiling to Level 50. SYSTEM REQUIREMENTS OS : Windows XP / Vista / 7 CPU : Dual Core	2 GHz RAM : 2 GB GPU : GeForce 6 Series / Radeon 1300 XT HDD : 10 GB Fallout: New Vegas® Ultimate Edition © 2011 Bethesda Softworks LLC, a ZeniMax Media company. Bethesda, Bethesda Softworks, ZeniMax and related logos are registered trademarks or trademarks of ZeniMax Media Inc. in the U.S. and/or other countries. Fallout, Fallout: New Vegas and related logos are trademarks or registered trademarks ofBethesda Softworks LLC in the U.S. and/or other countries. Developed in association with Obsidian Entertainment Inc. Obsidian and related logos are trademarks or registered trademarks of Obsidian Entertainment Inc.